Digi-Schlock: BAD DREAMS/VISITING HOURS (Shout! Factory 2-Disc Set) – Schlockmania! This 2-disc set finds Shout! Factory continuing to explore the genre backwaters of 20th Century Fox’s film catalog. This time, the DVD set pairs two horror films that share a hospital setting and the same decade: 1988’s Bad Dreams and 1982’s Visiting Hours. It offers a nice, cost-effective way for genre fans to catch up on their vintage horror and even manages to throw in a new extra along the way. 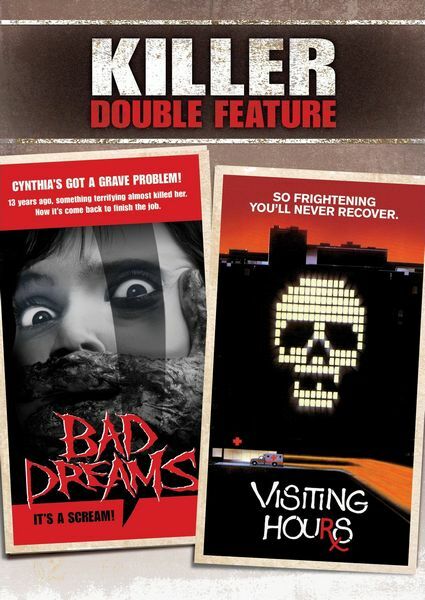 Both Bad Dreams and Visiting Hours were previously released in DVD editions by Anchor Bay Entertainment. However, both of those discs were released in 2006 and are long out of print. Both films look good in the anamorphic transfers they receive here: colors and detail are strong and there is a minimum of debris, resulting in a nice clean image. In terms of audio, Bad Dreams has both 5.1 and 2.0 stereo mixes. The 5.1 option was utilized for this review and it works well, using Jay Ferguson’s electronic-styled score to spacious effect and working in a few good directional effects during the big shocks. Visiting Hours sticks to a basic stereo mix and gets the job done nicely. Both discs also include a few extras. On the Visiting Hours disc, bonus features consist of a set of trailers and a still gallery. The trailers are fun to watch because they incorporate a creepy bit of animation that references the film’s distinctive poster design. The gallery is pretty comprehensive, covering everything from poster designs (including a creepy alternate version with masked doctors) to a variety of stills and on-set photos. It would have been nice to have a few more features but this works as a basic edition of this title. 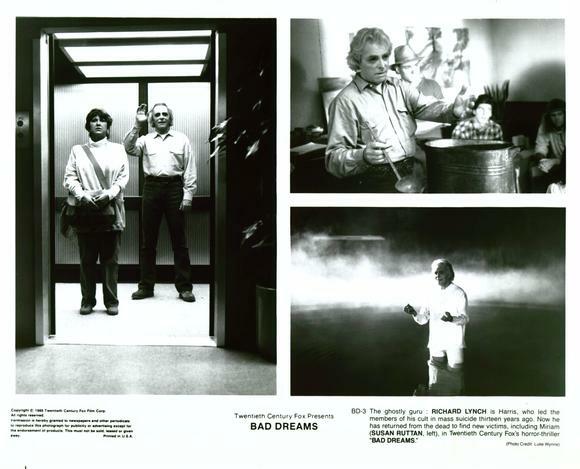 Bad Dreams ports over a variety of extras from the previous Anchor Bay edition. The most notable of these is a commentary track with director/co-writer Andrew Fleming. He’s moved on to a more mainstream career since then, including the excellent Hamlet 2, but he remains fond of his work here. He offers a chatty, often self-deprecating stream of comments about the film that covers the script, the shoot and the cast & crew. He is not afraid to point out things he would change today and tells some interesting stories about how James Cameron (then-husband of his producer) was a frequent visitor to the set and an unexpectedly complex tale about how “Sweet Child O’ Mine” by Guns ‘N Roses ended up as the film’s end credits song. The new addition to this disc is a featurette entitled “Dream Cast.” It was produced and edited by Michael Felsher and features interviews with cast members Bruce Abbott, Jennifer Rubin, Dean Cameron and Richard Lynch. All four participants are forthcoming about their memories of the shoot: Abbott is very charitable to all involved but chuckles at the disb elief-straining nature of the finale, Rubin and Cameron offer their differing perspectives on why they didn’t get along during the shoot and Lynch proposes a surprisingly serious interpretation of the film. Their comments are briskly edited by Felsher, who keeps the pace snappy with a nice collection of clips from the film. The result is informative and well worth a look. In short, this is another cost-effective double feature from Shout! Factory that delivers the goods. The films look and sound good, the new featurette is a worthwhile bonus and the two-for-one price seals the deal. Any 1980’s horror buffs who missed these titles the first time around will find this an affordable and informative way to catch up. For Schlockmania’s film review of Bad Dreams, click here. 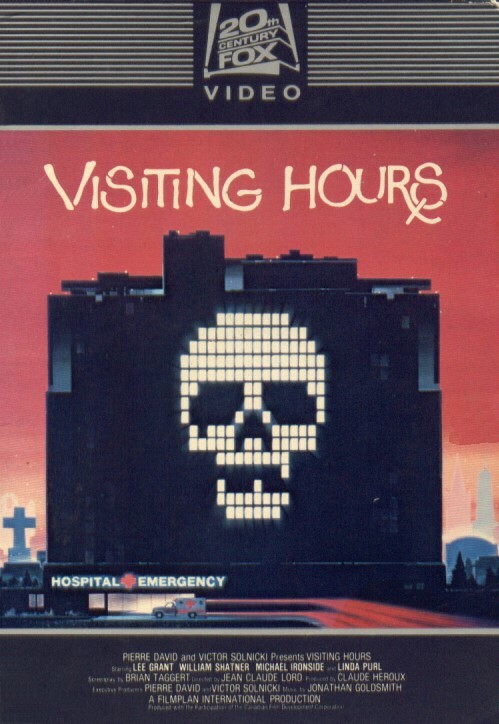 For Schlockmania’s film review of Visiting Hours, click here.